Numerous extremists groups are active across the Sahara-Sahel area and in the Lake Chad region. Most are extremely mobile and operate easily across national territories because of the porous nature of national borders in the region. Their actions are being increasingly constrained by military responses launched by national governments in alliance with international partners. Moreover, warring parties regularly develop temporary allegiances against a common enemy, but tend to not contribute to the establishment of a stable coalition between diverse and conflicting factions, thus obstructing efforts to achieve peace (i.e. conflict in Mali). 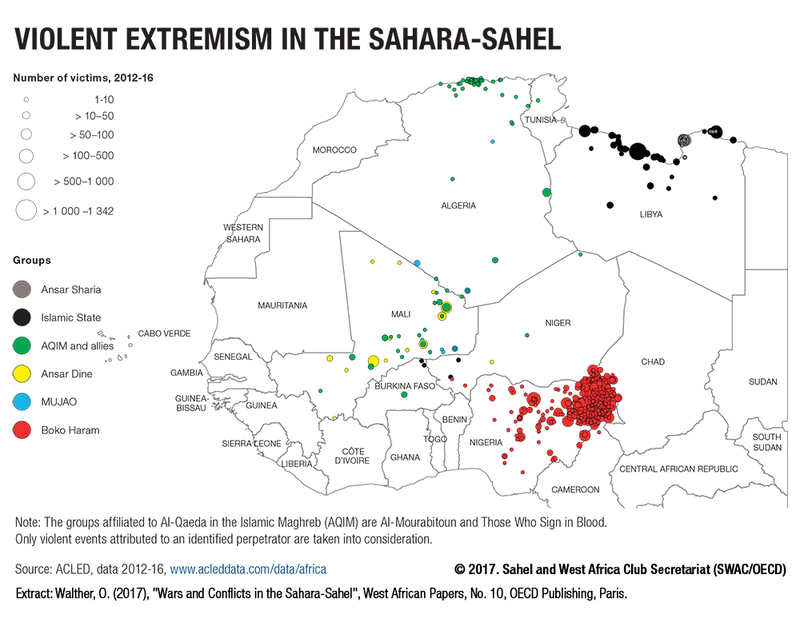 The mapping of the attacks that have been carried out by the main extremist groups in the region since the start of the war in Mali in 2012 illustrates the trans-national activity of terrorist groups. The Boko Haram insurgency caused, by far, the largest number of civilian causalities, mostly in northeastern Nigeria. Concerns over the deteriorating security situation has prompted calls for co-ordinated regional action to promote security, governance and development, and has given impetus to the creation of the G5 Sahel Joint Military Force. Additionally, the newly established Alliance for the Sahel aims to enhance regional partners’ co-ordination, while also scaling up the impact of development initiatives.